Not only is Kathy the editor of one of the best magazines out there, Concealed Carry, she’s the author of the book Cornered Cat and a co-author of Lessons from Armed America. 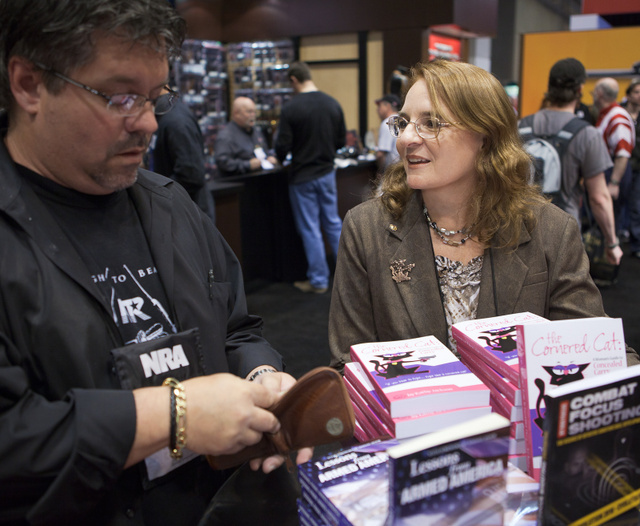 At the NRA show, her table was constantly surrounded by old fans and new readers alike. She also maintains the excellent Cornered Cat web site. This entry was posted in book, interesting people and tagged author, CCM, Cornered Cat, Kathy Jackson, Mark Walters, signing. Bookmark the permalink. I have read a good bit on her website. To say that it’s a site for females does it a disservice: I would point it out to ANYBODY thinking of buying a firearm for personal protection. +1 on Doc Jim’s comment. Oleg, thanks for pointing me to that website.